J. Peter Zopfi, D.O., never worries about developing stressed-based problems, despite his busy practice as a surgeon. In fact, he can honestly tell you that he has always been able to strike a balance throughout his life even though he is a dedicated, hard-working doctor. His secret is soccer. 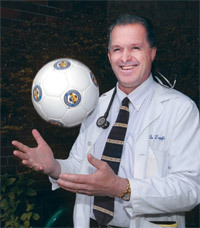 Dr. Zopfi’s athletic abilities, along with his academic scholarships, helped to finance his college education and subsequently led him to medical school. And he kept on playing.